Situated at an altitude of 350m in the verdant foothills of Mount Itamos, some 6k from Neos Marmaras, Parthenonas is a lovely little village, particularly as its beautifully preserved models of vernacular Macedonian architecture are hard to come by. 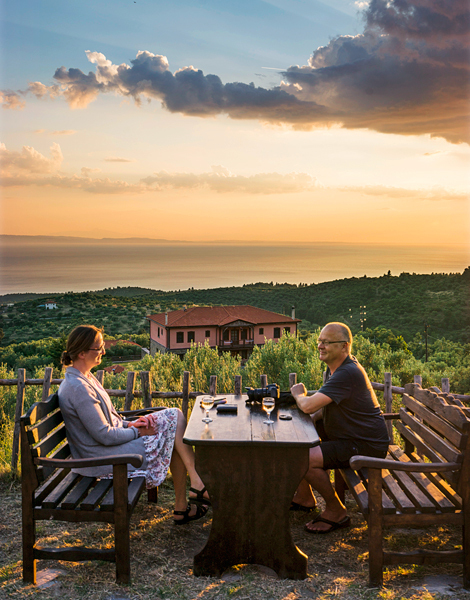 Yet just 50 years ago, things were very different; residents had abandoned the village en masse to find work at Neos Marmaras, the hub of a burgeoning tourism industry. It was several years after that before any interest was shown in this authentic village, thanks to media coverage and a government initiative to have it listed for preservation. This attention attracted individuals looking for a summer home off the beaten path. Dozens of “outsiders” came to the nearly deserted village, bought up the abandoned homes and restored them to their original glory, ushering in a new period of growth. Today, the pride of Parthenonas – other than the 1837 Church of Aghios Stefanos – is the old elementary school that serves as a museum of local history and folklore. Recently renovated, the museum now has an updated approach to the presentation of its exhibits and does not suffer from that quaint (but slightly sad) old-fashioned feel of so many local museums. 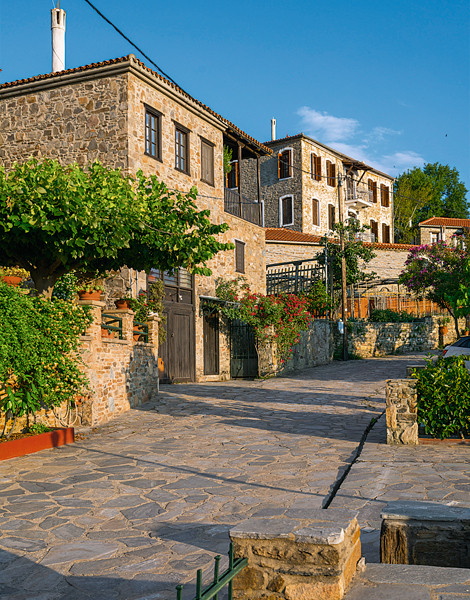 Parthenonas is arguably the most beautiful of Sithonia’s traditional villages. The view at sunset from Paul’s traditional taverna is mesmerizing. Luckily, our guided tour is conducted by Stella Margariti, president of the Parthenon Cultural Center and an authority on the village’s history and culture. She explains the significance of all the items exhibited, including the looms that ensured every household was well stocked with the rugs, throws, tablecloths and bedding for which this part of Greece is so well known. Kneading boards for bread and clay storage jars for pickles, olives, lard, sausages and sundry other pantry staples are further evidence of the village’s traditional past. The troknies are especially interesting – old-world baby carriers that allowed the women to keep their infants close while still leaving their hands free for chores. Parthenonas is not just banking on its past, however. Now in its second year, the Parthenοn Film Festival, draws summer crowds to the village’s main square with art-house fare and popular retro comedies. Brothers Fotis and Christos Politis, two of the five organizers, explain how the idea for this event came about.